Yesterday afternoon and evening I was working the cables on the back of the sweater and figured out that even the correction, posted online and included with the magazine, was incorrect. Cable 3rd row: p1, twice (slip 3 onto a CN and leave at back of work, k3, then k3 from CN), p3. After rows 5 and 9 work row 7 (and not row 3) as follows: Row 7: p3, k3k slip 3 onto CN and leave at front of work, k3, then k3 from CN, k3, p3. See also chart. Cable 3rd row: p3, twice (slip 3 onto a CN and leave at back of work, k3, then k3 from CN), p3. Row 7 should be worked as stated, in a normal chronological order. It should not be worked after row 9 because that would be a wrong side row and would be worked evenly. 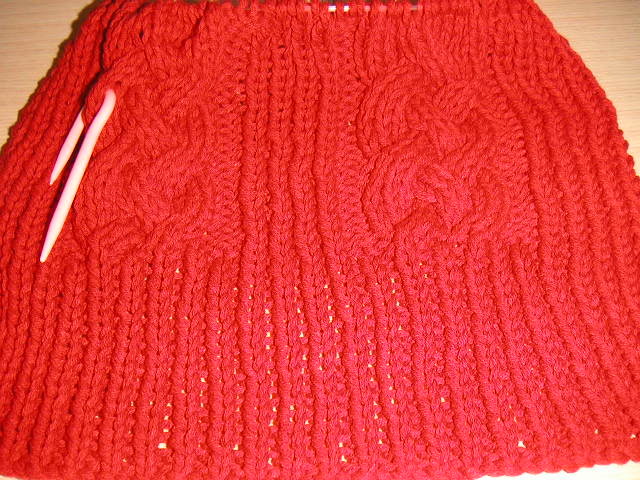 Then you start the cable pattern again with the corrected row 3. I tried knitting according to the correction and it was completely wrong. I was constantly checking my cables with those in the picture to see if they looked right, and at first, the cables appeared completely different though they really weren't. In the main picture the cables look elongated because the model is pulling down on the sweater, plus it was a little late and I've been known to read directions in the wrong context before. The cables do look correct don't they?